Bossam (보쌈) is a Korean dish, which is usually serve with alcoholic beverages. These variety of dishes which taste best with alcohol is known as Anju(안주) in Korean. I love to eat Bossam with perilla (kkaenip in Korean). You can also have your Bossam with lettuce and it taste equally good. Those who want to have a little more spice in their bossam, you can also add raw garlic, pepper, saeujeot 새우젓 (shirmp paste), sweet kimchi and/or ssamjang 쌈장 (a kind of spicy paste)! 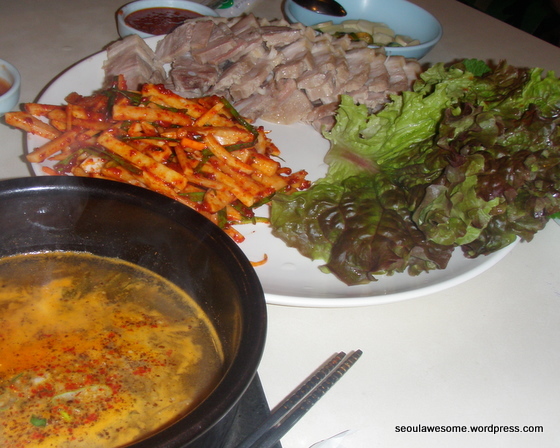 Bossam is a very affordable dish in Korea which can be easily found in small restaurants. Bossam can also be found in many Korean restaurant overseas. 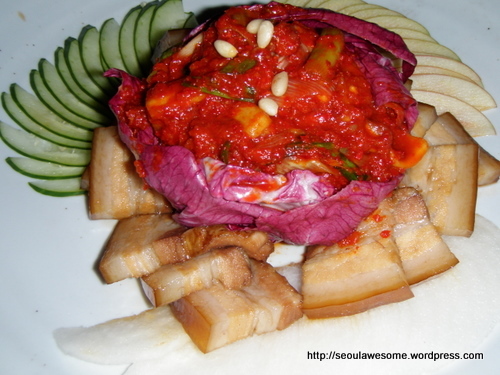 The above picture is a bossam-inspired Korean dish in a high-end restaurant located in Singapore. It cost about 5 times more than the ones you can find in Korea. Readers, please help me “Thumbs Up” my blog posts in the KoreaTaste.Org Campaign. This entry was posted in Korean Food and tagged Anju, Bossam, 보쌈, Kkaenip, Korean Food, Korean Pork Dish, Perilla, Pork Dish, Saeujeot, Ssam, Ssamjang, Sweet Kimchi by seoulawesome. Bookmark the permalink.